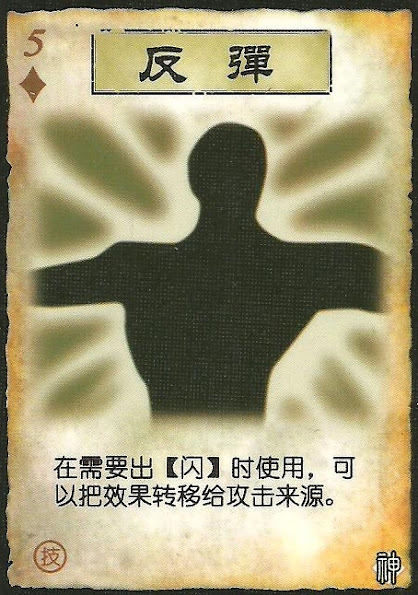 Whenever a player need an escape, they can use this card to reflect the effects back to the player targeting them. This is used in response to cards such as Attack. When this is used, the source is then attacked. The source is themselves If they then do not use an Escape, they are damaged by themselves. A Mirror can be used in response to another Mirror. If the original character has abilities that affect the attack, or whatever asked for the Escape, those abilities remain in effect after the attack is reflected. For example, Lu Bu attacks you. Normally you would need two Escapes to get out of it. If you use a Mirror, the attack reflects back to Lu Bu. He then needs two Escapes to get out of his own attack. If he was damaged, he would be the source of it. Lu Bu could use a Mirror of his own to reflect the attack back at you. This can be used in response for more than just an attack. This can be used for Hail of Arrows, Throw Knife, Shoot, and others.